Review: Inaugurated by Luke Slater (as L.B.Dub Corp) and ASC in 2011, 'Parallel Series' has continued to host split releases from the likes of Shifted, Samuli Kemppi, Bas Mooy, Chris Finke, Developer, Truncate, Sev Dah, Jeff Rushin, and more. 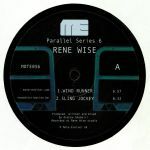 For its next instalment, Brighton based producer Rene Wise returns to Mote-Evolver having debuted on the label last year. 'Wind Runner' features a relentless bassline and substantial kick, married to swooping industrial textures generating abstract rhythms, before an arpeggiated bass melody joins ghostly vocals in 'Sling Jockey'. Both tracks are choice cuts picked by Luke Slater who's been hammering Wise's demos in his sets throughout the last year. Making his Mote-Evolver debut, Billy Turner distributes sharp oscillating frequencies with syncopated drum hits in 'Charging Totem', then 'Magma' erupts dangerous modulating stabs whilst ethereal reverb evolves into a cacophony of intense energy.